Sequel to the 2011 action hit 'THE MECHANIC'; which is a remake of the 1972 flick (of the same name). The film once again stars Jason Statham, as the retired hitman named Arthur Bishop (played by Charles Bronson in the original 1972 flick). In this installment, he's forced to come out of retirement and kill three criminals; in order to save the woman he loves. It was directed by German filmmaker Dennis Gansel; and it was written by Philip Shelby, Tony Mosher, Brian Pittman and Rachel Long. The film costars Jessica Alba, Sam Hazeldine, Michelle Yeoh and Tommy Lee Jones. It's received mostly negative reviews from critics (of course), but it is meeting the usual Jason Statham B-movie Box Office standards. I thought it was OK.
Arthur Bishop (Statham) has been retired, and living under a fake name in Rio de Janeiro, for some time (after faking his death in the last movie); until he's visited by a mysterious woman (Yayaying Rhatha Phongam), and some mercenaries. They want Bishop to do a job for a secret employer. He refuses, and flees to Thailand. There he meets an abused woman named Gina Thorne (Alba). He falls for her, as he learns the mysterious employer wants him to; and when she's kidnapped, he's once again forced to murder three criminals (and stage their deaths as accidents). The movie is extremely clichéd, and horrendously cheesy (at times). 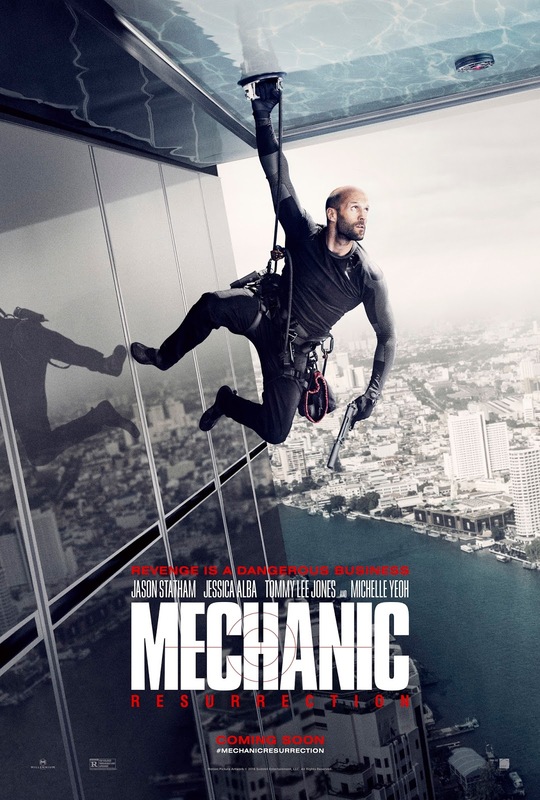 It does have some decent actions scenes though, and Jason Statham doing what he does best. The celebrity supporting cast is mainly just there as extended cameos though, and their talents are wasted. I also wasn't impressed by Gansel's directing. The original remake was much better; I actually don't think I've ever seen the original 1972 film (possibly an edited version, on TBS, but I don't remember).